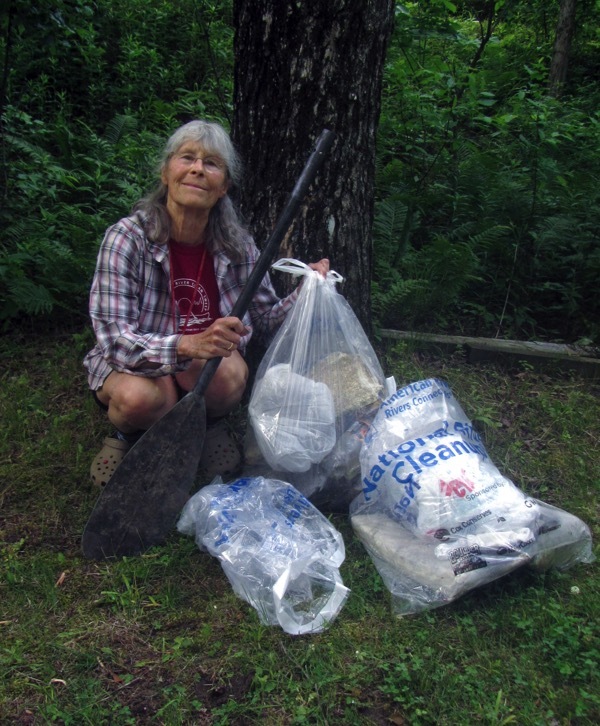 Lois and John led an exciting cleanup on the Upper Pine. 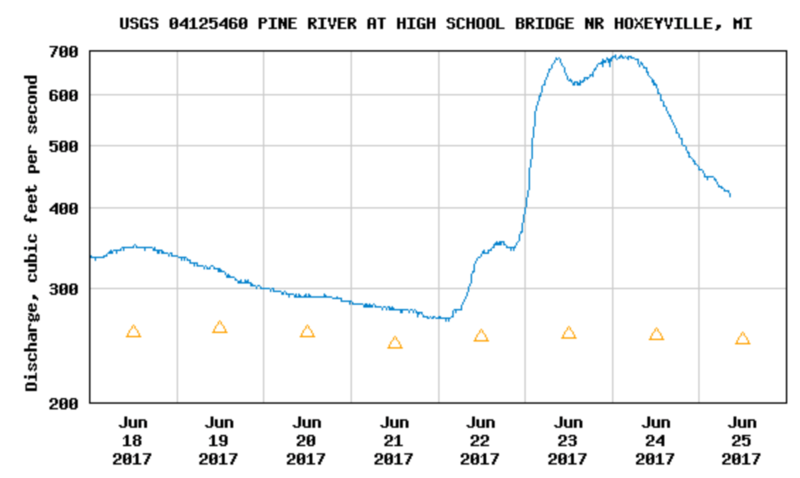 The river was running at 700cfs, 3x normal. This somewhat limited our clean up activities but did give us a bit of a wild ride. 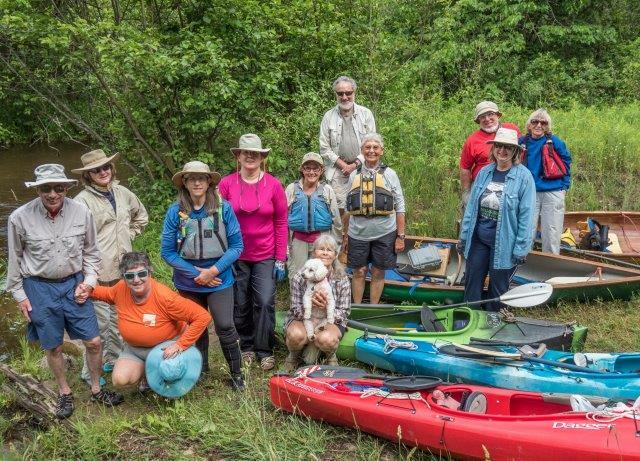 Our complement included John Heiam, Sue Wilgus, Lois Goldstein, Tracie Lord, Linda Pelkey, Linda Woodruff, Jocelyn Trepte, Max the Wonder Dog, Harold Lassers, Marlene Puska, Doug Barnes, Pam Lassers, and Lindy Barnes. Most of the day was clear but we were treated to a short-lived downpour after our lunch stop. As the skies cleared, the breeze picked up, giving us wonderful opportunities to experience opposing and reinforcing turbulent flow phenomena in two media concurrently. Stars of the day included Jocelyn, displaying one of the two shoes recovered, and the results of our harvest. Sue recovered a boat cushion. Another star of the day was John's new boat. I tested his 13 foot Mohawk and found it a delightful, maneuverable, stable, and indestructible clean-up craft. 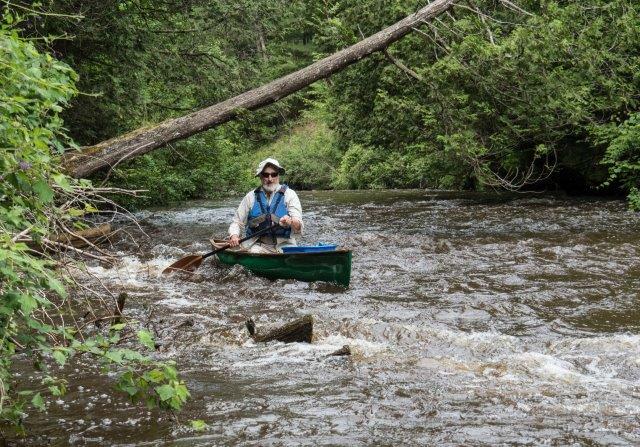 Below I navigate the pushy water in my renovated Sawyer Wildfire 13.5. This boat was the exact opposite of John's Mohawk: Tippy, Fast, and Green. Photos by John, Jocelyn, and Harold.